It's no secret, that I am obsessed with Dove. From its shampoo and conditioner to deodorant to soaps the scents, the quality and overall the feeling I feel while wearing the products is amazing. I feel clean, refreshed and ready to take on the world. Lately, especially during this busy holiday season I have been spending lots of time at Sam's. It's a one stop shop for me and my hubby on getting the things we need to survive this season. 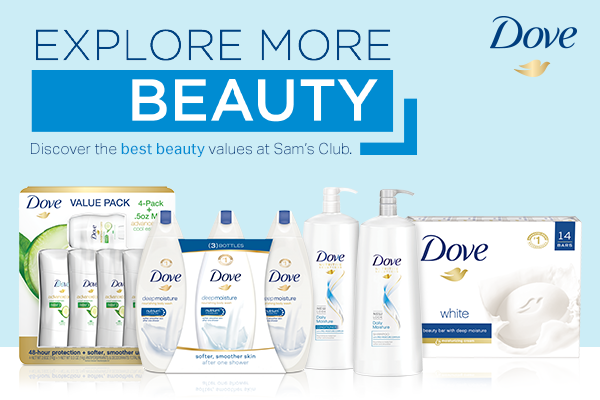 I have already stressed over gifts, wrapping them and the one thing I do not want to worry about is going to different stores ... why stress myself out when Sam's personal care isle has shelves of various Dove hair, skin and deodorant products that you may already know and love, set at prices you can’t beat. These are a few of the products you'll find, that I've purchased.